Maine quarterback Warren Smith (8) falls on a fumbled snap as New Hampshire defensive ends Randi Vines, left, and James Jenkins (56) and Maine offensive lineman Josh Spearin (74) close in during the fourth quarter of an NCAA college football game at Cowell Stadium in Durham, N.H., Saturday, Nov. 19, 2011. New Hampshire defeated Maine 30-27. New Hampshire receiver R.J. Harris (15) catches a touchdown pass ahead of Maine defensive back Trevor Coston (3) during the fourth quarter of a NCAA college football game at Cowell Stadium in Durham, N.H., Saturday, Nov. 19, 2011. New Hampshire defeated Maine 30-27. New Hampshire running back Nico Steriti (22) runs past Maine linebacker Vinson Givans (4) for a touchdown during the fourth quarter of an NCAA college football game at Cowell Stadium in Durham, N.H., Saturday, Nov. 19, 2011. New Hampshire defeated Maine 30-27. Maine defensive back Trevor Coston (3) breaks up a pass in the end zone intended for New Hampshire tight end Sean Cullen (87) during the second quarter of an NCAA college football game at Cowell Stadium in Durham, N.H., Saturday, Nov. 19, 2011. DURHAM, N.H. — Judging from the demeanor of coach Jack Cosgrove and his players, one might have thought the University of Maine football team’s season had ended Saturday. The Black Bears, who had an NCAA at-large bid pretty much locked up going into the rivalry game against New Hampshire, had hoped to return to Orono with at least a share of the Colonial Athletic Association title and the Brice-Cowell Musket. Instead, UMaine could only think about missed opportunities. 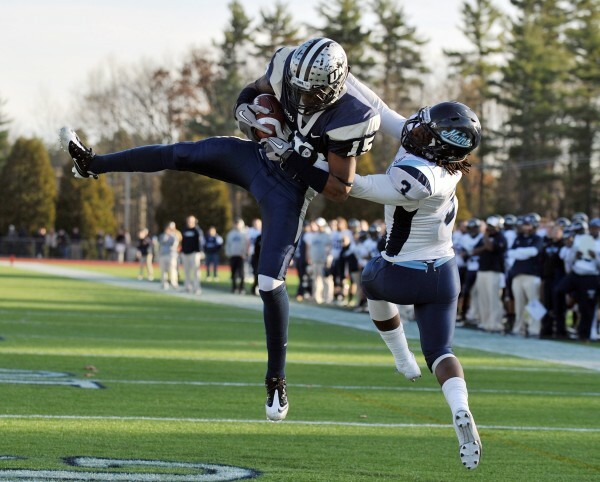 UMaine committed four turnovers, all in the second half, and New Hampshire scored two touchdowns in a span of 15 seconds early in the fourth quarter to pull out a 30-27 victory in their mutual regular-season finale at Cowell Stadium. Coach Jack Cosgrove’s Black Bears (8-3, 6-2 CAA) found out Sunday they will travel to Boone, N.C., for a Dec. 3 second-round playoff game against Appalachian State (8-3). The Wildcats (8-3, 6-2 CAA) also were among five CAA teams to qualify for the postseason and play a second-round game at Montana State. The Bears took the loss hard, believing it would relegate them to a first-round playoff game. It proved not to be the case. “We got the best [outcome] we could have asked for,” Cosgrove said Sunday, a day after turnovers and poor execution in key situations cost them a game. Towson University (9-2, 7-1 CAA) won the CAA title and the league’s automatic playoff bid by virtue of Saturday’s 28-17 victory at Rhode Island. On Saturday, the 11th-ranked Bears worked their game plan to perfection, controlling the ball and the clock with good offensive balance. They wound up squandering a 10-point, first-half lead and committed a season-high four turnovers — including three interceptions by senior quarterback Warren Smith — to help fuel No. 12 New Hampshire’s fourth-quarter rally. Smith completed 24 of 41 passes for 200 yards and a touchdown but was picked off three times in the second half. That included two interceptions and a fumble during a span of three minutes, 23 seconds that also included a fumble and an interception by UNH. “Good football teams don’t do that,” Cosgrove said of what he called sloppy quarterback play. “It’s a tough loss,” Smith said Sunday. “We didn’t play well. 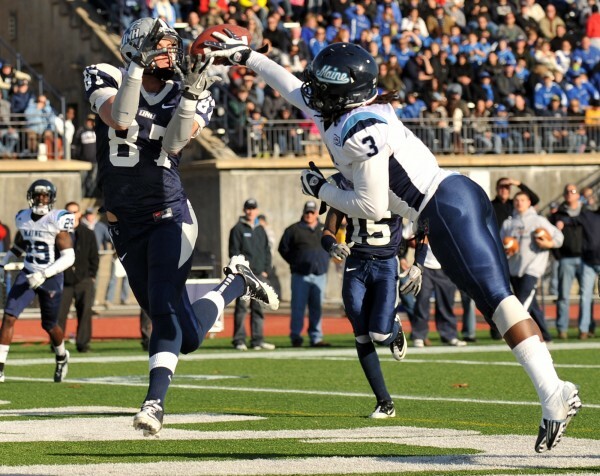 UMaine had extended its lead to 20-16 on Brian Harvey’s 22-yard field goal with 2:29 left in the third quarter. Two plays later, Chris Chandler fumbled and UMaine’s Troy Russell recovered at the 25. Chris Houston intercepted Smith on the next play. Darlos James then intercepted UNH quarterback Kevin Decker (16-for-30, 203 yards, three TDs, three INTs) at the UM three-yard line on the ensuing play. Only five plays later, Smith was intercepted again by Houston. “We came out here and didn’t execute, bottom line,” Smith said. “You’ve got to make plays, especially in November,” he added. The Wildcats made some plays with the game on the line. They scored the go-ahead touchdown on Decker’s five-yard lob to R.J. Harris (six receptions, 106 yards, two TDs) with 13:41 to play. Mike MacArthur’s PAT made it 23-20. On the ensuing kickoff return, UNH’s Steve Thames stripped the ball from Kendall James and Manny Asam recovered at the UM 18. Nico Steriti (21 carries, 150 yards) danced into the end zone on the next play to give the Wildcats a 10-point lead with 13:26 left. Smith directed an 11-play, 65-yard drive that he finished off with a scrambling, 10-yard TD throw to Damarr Aultman (12 rec., 105 yards) in the end zone. Harvey’s PAT got the Bears within three with 9:23 remaining. The teams traded punts before UNH ate up nearly five minutes with a drive that ended with a punt and 2:05 left. On its final series, thwarted by a botched shotgun snap on third down, UMaine’s hopes ended when Chad Wilkes intercepted Smith at the UNH 45. Pushaun Brown netted 77 yards on 20 carries for UMaine. Justin Perillo caught seven passes for 63 yards. 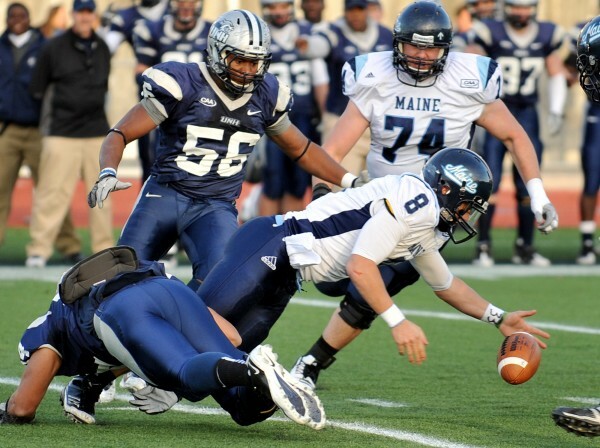 End Mike Cole spearheaded the UMaine defense with seven tackles, including three sacks, while Trevor Coston had six tackles and an interception and Erwin Roach made six tackles. 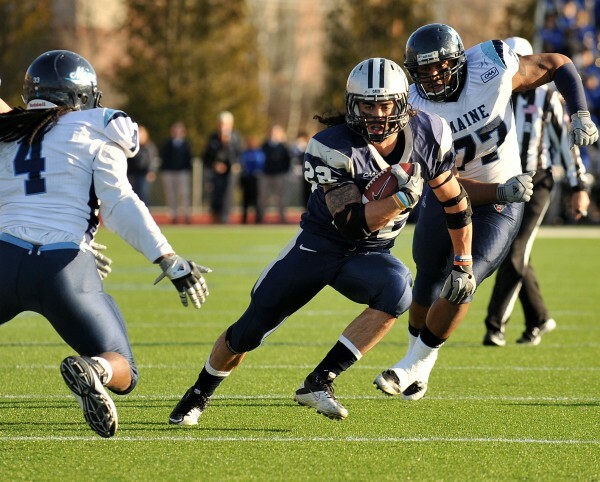 Chris Beranger racked up 16 tackles for UNH. The Bears took a 7-0 lead on Brown’s 33-yard run, but UNH answered on a 34-yard pass from Decker to Harris. Smith’s two-yard TD run put UMaine on top 14-7 with 56 seconds left in the first quarter, then Harvey’s 41-yard field goal made it 17-7 midway through the second quarter. However, a 15-yard personal foul penalty against Jerron McMillian on a second-down play at the UNH five-yard line helped give the hosts life with 2:25 left. The Wildcats marched 72 yards on 14 plays to get MacArthur’s 32-yard field goal with 18 seconds left in the half. “I’m standing there on the sideline thinking we go two-minute drill and add to the [point] total and we’re dumb on their sideline,” Cosgrove said of the penalty. “It cost us three points. I’m not happy about that,” he added.